AN EXCITING week just got even better for towering pace bowler Cameron Gannon, with the Brisbane Heat re-signing the competition's leading wicket-taker from last summer. The former Ipswich Grammar School student will suit up again for the Heat, with the contract icing a memorable seven days for the 25-year-old quick. Gannon last week managed to dodge an angry snake and win a five-night golfing holiday to China. Playing at Brookwater Golf Club last Friday as part of a charity day to raise funds for Multiple Sclerosis, Gannon and playing partner Cameron Boyce had a surprising encounter with a large black snake. "I was just off the fairway looking for my ball and virtually stepped on it," Gannon said. "It struck at me twice and Boycey reckoned he had never seen me move so fast. "It certainly made the putt interesting when I got to the green. "I figured it was my lucky day anyway so I bought a raffle ticket later on. "I ended up winning a trip to China to play five days at the world's biggest club at Mission Hills, which has got like 12 courses to play, so it turned out pretty well." Gannon is the latest addition to the Heat contract list, joining fellow former IGS student Nathan Reardon, fellow quicks Nick Buchanan and Mark Steketee and wicket-keeper James Peirson on the books so far in the signing window. The 199cm Gannon finished with 18 wickets at 11.94 last season to be the number-one bowler in the competition, claiming four more scalps than the next most successful bowler. 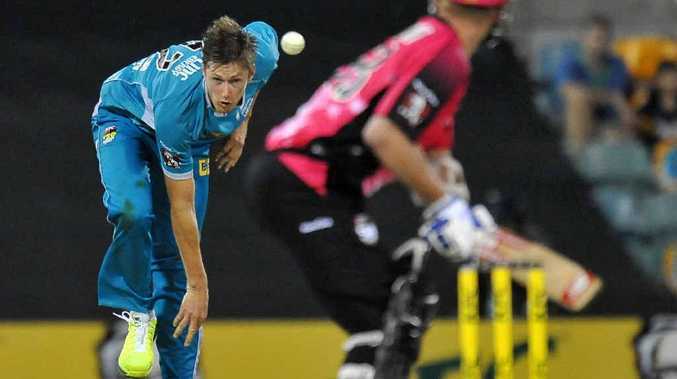 Gannon successfully took on the "closer" role for the Heat, twice finishing with four-wicket hauls with his efforts at the death including bests of 4-11 against the Thunder, 4-24 against the Sixers and 3-11 against the Strikers. "There was an opportunity there and I was keen to take it," he said. "It was a great experience and I think the club has got together a strong line-up again for this season."